You just can’t beat the laughs and giggles you hear from your kids when they’re flying a kite! So why not check out our awesome list of the best kites for kids and find one that your child will love to fly? Kite flying is a really fun way for your kids to pass the time and it’s a great opportunity for family bonding. Whether you’re at the beach, the park, or an open field, the day will zip by as you bask in the warm sunshine and feel the breeze on your face. Flying a kite not only helps your child improve their motor skills and coordination, it also helps them learn how the wind works and figure out how to use the wind to their advantage. It’s great exercise and it’s something that kids of all ages can quickly learn to do. To make sure you’ll find a great kite for your child, we’ve reviewed all kinds of kites: Kites for beginners, kites for more seasoned kite flyers, and stunt kites for kids that are looking for even more fun and adventure. And because kids love how kites look when they’re flying high in the sky, we’ve covered all kinds of great looking kites: Rainbow kites, dolphin kites, snake kites, and 3D kites. We even threw a cool looking alien jellyfish kite in there – just for fun. We’ve spent hours sifting through tons of kites to make sure we bring you only the best of the best. So have a look at our top kite choices; we’re confident you’ll find an awesome, fun kite that your child will be thrilled to fly! If you’re looking for a kite that is easy and fun for both kids and adults to fly, this Large Delta Rainbow Kite may well fit the bill! Made from weather resistant ripstop nylon, it’s reinforced in specific areas which strengthens the kite overall. Plus it has fiberglass rods to help the kite keep its shape. Measuring 43″ wide and 80″ long, with the tail comprising 31″ of the total length, it flies best in winds ranging from 5-16 mph and comes with 200 feet of line plus a handy kite bag. Although it’s recommended for kids 5 and up, some parents find that younger kids can handle this kite too, especially once it’s in the air. One helpful thing a number of parents said is that you might want a stronger line just to make sure the line doesn’t break when you’re flying this rainbow kite. 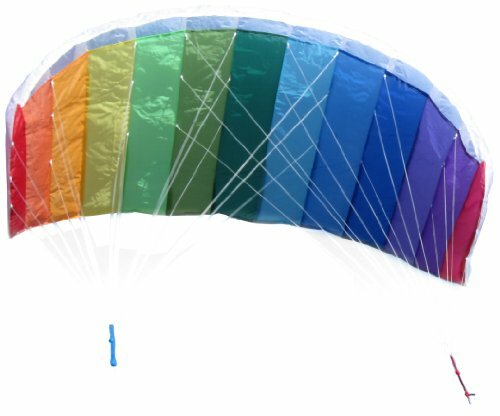 This Large Delta Rainbow Kite is a fun kite that entire family can enjoy flying! This In The Breeze Rainbow Sparkler Kite is a great beginner kite that both kids and adults enjoy flying. In addition to rainbow, this single line kite comes in several other color patterns, including patriotic, sunset, and tie die. It measures 46″ wide and is 82″ long with a 60″ streamer on each side of the kite. The two long streamers help keep the kite stable once it’s in the air. 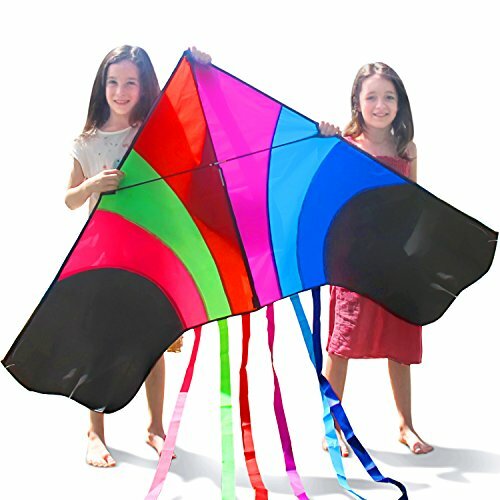 Made from durable and strong ripstop fabric, this colorful kite comes with 130 feet of twisted polyester line and a bag. The bag makes carrying, storing, and traveling with this kite very easy and convenient. Recommended for kids 5 and up, it flies best in 6-20 mph winds and is easy to get and keep in the air. Most people find this kite is easy to assemble and disassemble. But they suggest you get a longer, more durable kite string before flying this In The Breeze kite. A fun kite for those windy days in open areas or at the beach, both kids and adults enjoy flying this flashy kite and taking it to new heights. People of ages think it’s lots of fun to fly! 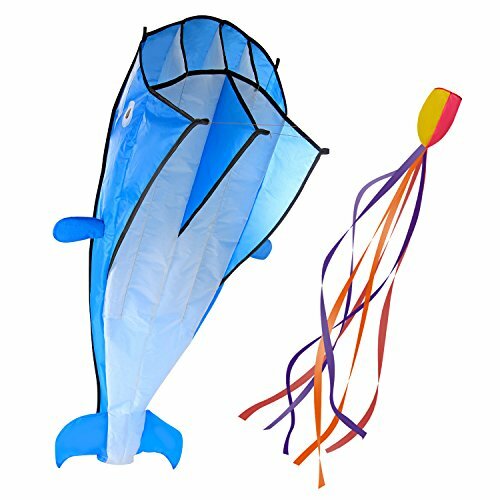 This gorgeous Parafoil Giant Blue Dolphin Kite is a great kite for any child who wants a 3D kite. It comes in blue, black, red, and orange and is made from tear-proof cloth that’s reinforced in specific areas to add strength and durability to this kite. It also comes with an easy to grasp kite spool, a colorful tail that’s almost 11 feet long, over 400 feet of kite line, and a bag for easy storage and carrying. 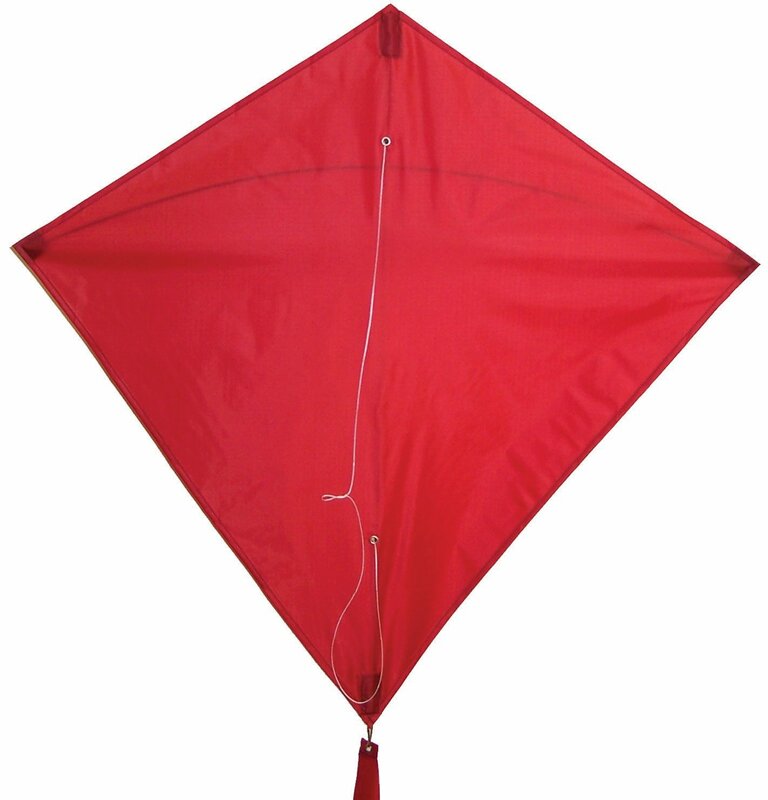 Because this is a parafoil kite, it has no rigid frame or rods, so it works much like a wind sock, requiring a decent wind to fill it and keep it airborne. Although this dolphin kite is recommended for kids 6 and up, many parents state that it feels quite heavy when it’s full of air flying in the sky. For that reason, the pull may make it too difficult for younger or smaller kids to fly on their own. The other thing many parents suggested is that you buy a stronger and longer string because this awesome kite can fly over 800 feet high. This Parafoil Giant Dolphin Kite is sure to be a huge hit with kids and adults alike! The Hengda Large Power Snake Sports Kite is a real show stopper and is sure to catch everyone’s eye when it’s flying high in the sky! Flying easily in 3-6 mph winds, it comes with about 100 feet of line and its own bag for convenient storage and carrying. 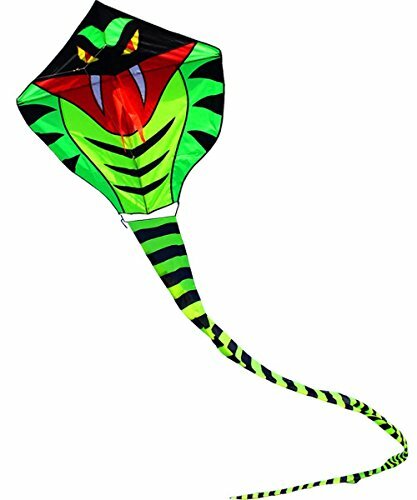 This snake sports kite is made from strong nylon material and it’s about 40 feet long, so you need to have quite a bit of space to fly it. Designed to perform fun stunts, the cool face and extra long tail on this Hengda kite make it look like a menacing snake winding across the sky. 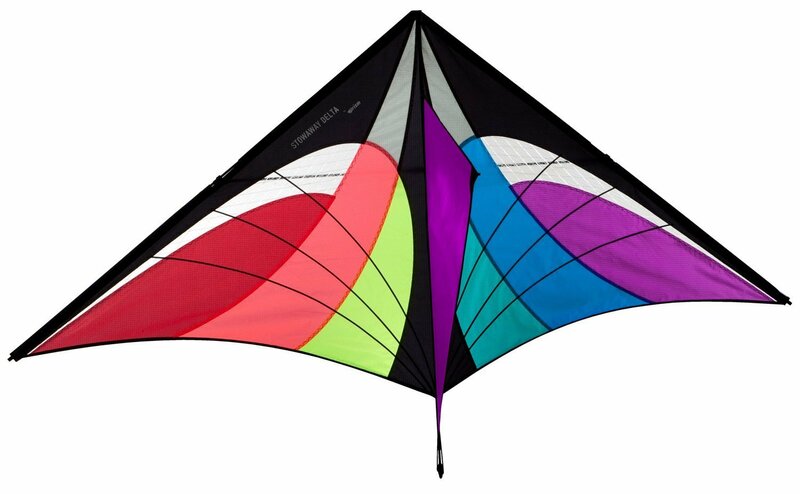 Although this kite looks really nifty and is fun to fly, users said that the line that comes with it isn’t the best quality and not long enough. So many people suggest you buy a longer, more sturdy line if you intend to fly this kite a lot. Due to the length of this kite, younger kids may need help getting it into the air. But once it’s launched and flying, most kids 6 and above should be able to fly it. This Hengda Power Snake Sports Kite is a great stunt kite that’s tons of fun to fly! This stunt kite is really fun to fly! The Prism Stowaway Delta Kite comes in three colorful patterns: Spectrum, Fire and Ice. This brightly colored kite is 36″ tall and 64″ wide and you can add extra tails or spinners (sold separately) for even more color and excitement. Along with the kite, you also get a hoop line winder, 200 feet of 30 lb tangle-resistant line, a triple ribbon tail that helps stabilize it when it’s in the air, a storage bag, and instructions on how to assemble the kite. The kite itself is made up of very strong aerospace material and the frame of this Delta kite folds up like a tent pole, making for easy transport and storage. This is an easy kite for kids to fly because it’s easy to launch and control. However, some parents state that the hoop winder is not the best quality and should be replaced if you’re planning on flying this kite a lot. 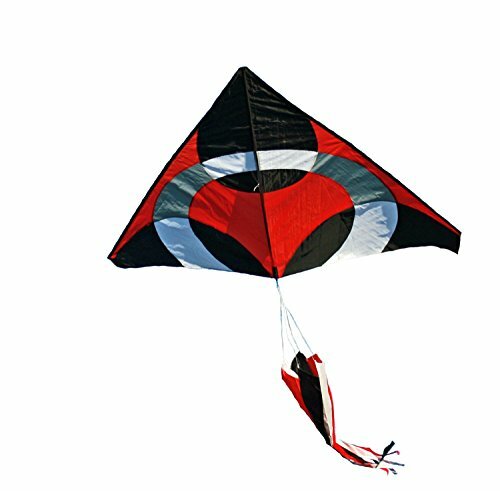 This brightly colored Delta kite is sure to capture everyone’s attention and will look great sailing against the blue background of the sky. It’s a wonderful kite for anyone looking for a kite to fly just for fun. Kids think it’s lots of fun to fly! This In the Breeze Rainbow 62 Inch Sports Kite is a fun kite for intermediate kite enthusiasts who want to try their hand at kite flying tricks. It comes in two colorful styles: rainbow or tie dye, and you get 80 feet of 50 pound weight braided polyester line and a convenient carry bag along with the kite itself. Most people purchase a longer line so they can fly the kite much higher than 80 feet. Made from Ripstop polyester, kids love that not only can they do stunts with this kite, but also that it looks like a huge parachute when it’s up in the air. Measuring 62″ long and 27″ wide, it’s easy to assemble, completely frameless and flies well in 6-25 mph winds. 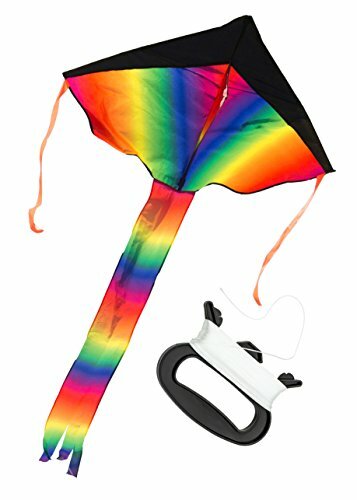 This Rainbow sports kite does have an extremely strong pull and therefore isn’t recommended for kids under the age of 12. This Weifang Giant Delta Ring iKite is the perfect kite for flying on those windy spring and summer days. Available in red, pink, green, and yellow, it measures 78″ high and 46″ long and has a 60″ windsock tail. This kite can be flown with or without the tail. Made of strong nylon material with a fiberglass frame, it comes with a handle that has just over 130 feet of line on it, and a convenient carry bag. This kite can be flown with or without its tail. It flies well in 3- 20 mph winds and a lot of users recommend you purchase a longer and stronger line, or use fishing line. This kite has quite a strong pull once it’s airborne, so it may be difficult for younger or smaller kids to fly on their own. For that reason, it’s best suited to kids 8 and up. Kids love that when it’s attached, tail of this kite swirls around and looks really cool! It’s easy to launch, despite its large size. 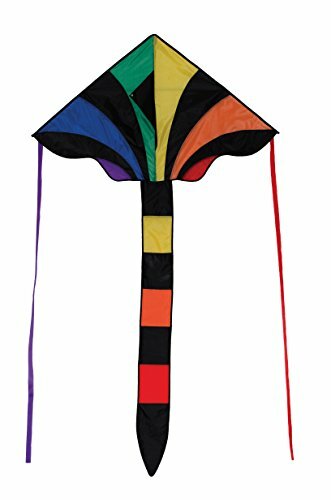 This huge Tomi Rainbow Kite is a great kite for families with kids of different ages because it’s ideal for both beginner and seasoned kite flyers. Made from weather resistant ripstop fabric with a frame made of flexible fiberglass rods, it’s 60″ wide and 32″ long with six long tails. Kids love the beautiful rainbow stripes and multiple colorful tail streamers, and parents say it really stands out when it’s flying high in the sky. Recommended for kids 3 and up, this rainbow kite comes with over 300 feet of string, its own carry bag, an instruction manual, and a lifetime warranty. Despite its large size it’s extremely easy to launch, making it possible for younger and smaller kids to be able to launch it with very little help. It’s an ideal kite for the beach, park or any open field. It’s also really easy to assemble and fun to fly, making it the perfect kite for kids of all ages. As with many of the kites on our list, a lot of users said it’s a good idea to change the line to something longer and more sturdy. Kids think it’s really fun to fly! This cool Sky Born Alien Jellyfish Kite is a fun kite for kids of all ages to fly on a windy day. Handmade from durable ripstop nylon, it has reinforced seams and fiberglass rods. Available in blue or red, it measures 8.5 feet long by 2 feet wide and is stain, rust, mildew, UV, and fade resistant. This Sky Born kite comes with its own kite string winder, 200 feet of strong string, and a carrying case for easy storage and transport. It folds up quickly and is made to be exceptionally easy to fly. It will fly easily in just 5 or 6 mph winds, but is strong enough to withstand higher wind speeds as well. Although this kite is fairly easy for kids to fly, the sheer size of it means smaller kids might need help getting it launched. Parents like that this kite has a lifetime guarantee and kids love that once it’s airborne, this kite is a real attention grabber, making it even more fun to fly! Kids think it looks really cool and is fun to fly! This awesome Prism Jazz Dual-Line Stunt Kite is ideal for older kids and is a fun kite for both beginners and experienced kite flyers. Available in three stunning and colorful patterns, it folds down small, making it easy to transport to the beach or open field. Measuring 62: wide and 28″ tall, it’s well made with a durable frame and it’s sturdy in the air. It comes with 85 feet of 55 pound line and a winder, wrist straps and winders, and its own storage bag. You also get easy to follow instructions that will have you doing cool tricks with this stunt kite in no time flat. This dual-line kite is more for tweens and teens, as opposed to younger kids because it takes a good amount of arm strength to guide this kite and perform stunts with it. You do need a fairly strong wind to launch this kite and keep it airborne. Once in the air, you’ll have a blast experimenting with all the things you can do with this kite. You’ll probably want to invest in better quality and longer line so that you can fly this kite as high as you want and perform various tricks with it. 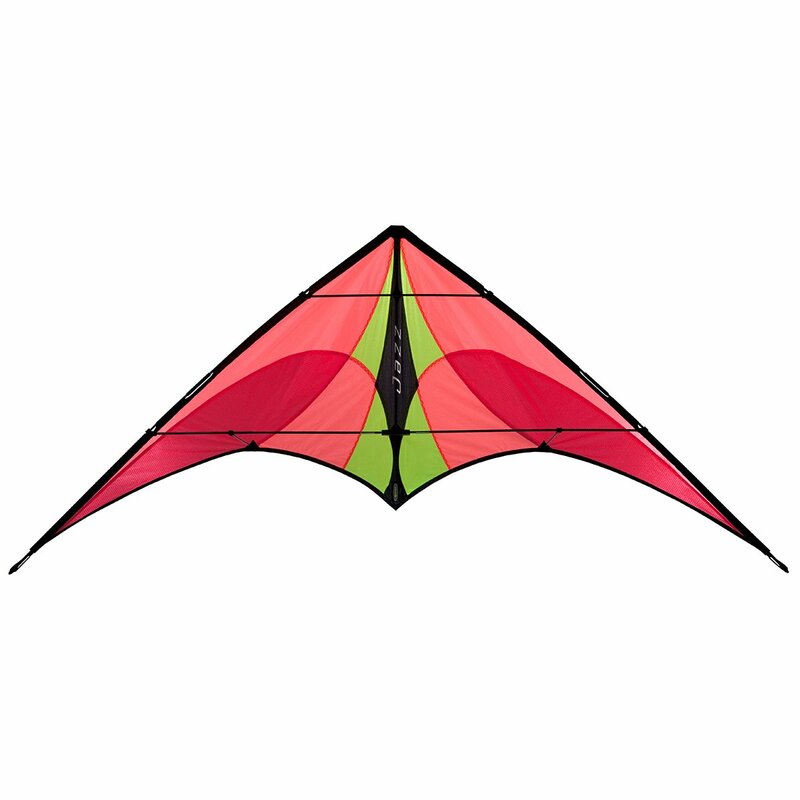 This kite is high quality and looks really great floating above the water or in the park. And don’t be surprised if you attract a lot of attention once you’ve mastered the skills to perform all the tricks this stunt kite is capable of! The bright colors and large size of this kite makes it fun to fly! It’s easy to see, even when its hundreds of feet in the air. The BeMax Soft Octopus Kites come in a pack of 3 and is ideal for any kite flying family! You get one red, one blue, and one green kite in this pack and each of them has a long colorful tail. Each kite measures about 6″ X 6″ (not including the tail) and kids love that they all have bells that jingle when they’re flying. Each one comes with its own line and winder, plus a carry pouch for convenient storage and transport. 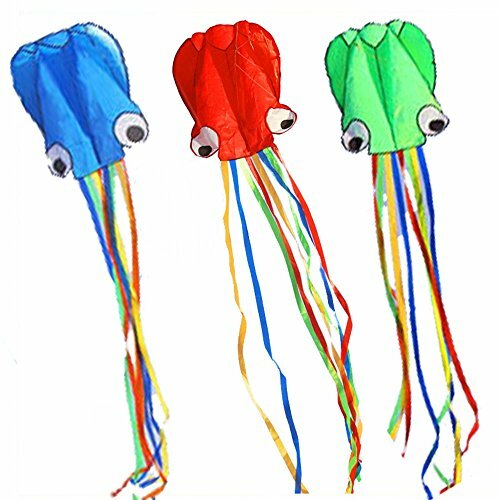 Although younger kids might need help launching these cute octopus kites, once in the air they’re very easy for kids as young as 3 or 4 to fly. These BeMax octopus kites look great up in the sky and kids enjoy having contest to see who can get their kite to fly the highest or stay up in the air the longest. These kites are perfect for flying in low wind conditions and they’re great for families with more than one child to play together flying kites. 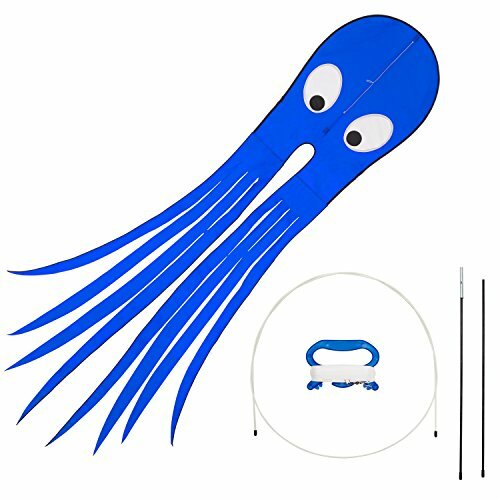 This package of 3 soft octopus kites is sure to provide plenty of fun for the entire family! Kids of all ages love flying these adorable octopus kites! This In The Breeze 30 Inch Diamond Kite is a perfect kite for younger kids and beginners to enjoy. Lightweight and durable, this single line kite comes in a wide variety of fun colors and is made from strong ripstop polyester. It’s stain, UV, and mildew resistant and when assembled, measures 30 inches by 30 inches. Along with the kite itself, you also get three 12 foot long tails, a line winder, 130 feet of line, and a carry bag. This kite flies best in 6 to 20 mph winds and the smaller size makes it an ideal kite for beginners and smaller kids. It’s easy to launch and easy to fly, and with all the colors to choose from, there’s sure to be one your child will love. While the 130 feet of line this kite comes with is probably suitable for younger kids, older kids like additional line because they can fly it higher, get the kite up into the stronger air, and keep it airborne for longer. Parents like that this diamond kite looks like the traditional kites they grew up with and kids of all ages say it’s lots of fun to fly!